“The marine environment is a precious heritage that must be protected, preserved and, where practicable, restored with the ultimate aim of maintaining biodiversity and providing diverse and dynamic oceans and seas which are clean, healthy and productive.” (Commission Decision 2008/56/EC). 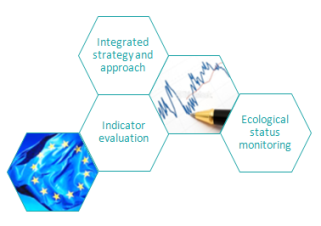 Quiet-Oceans contributes to strategy development and advises the European Community Member States on evaluating and monitoring Good Environmental Status when introducing underwater noise energy, as defined in the Marine Strategy Framework Directive (MSFD, Commission Decision 2010/477/EU). Our integrated approach allows you to map and statistically analyze continuous or impulsive noise levels that may affect the marine environment. To exploit the marine environment whilst respecting and protecting marine life. By predicting the statistical distribution of noise levels and risk zones on the marine species present. By measuring underwater noise and providing noise mapping. By supporting you in complying with regulations and respecting the marine environment.